Do you currently participate in or plan to attend trade, industry, or marketing events like shows, fairs, markets, expos, conventions, exhibitions, etc. to promote your business? In this step-by-step tutorial, you will learn how to generate more leads and sales online for your business at these events using WordPress and QR codes and without using expensive or complicated solutions. You can add QR code images to just about anything: billboards, banners, brochures, flyers, posters, labels, stickers, business cards, packaging, etc. If you plan to participate in trade, industry, or marketing events regularly, then you will want to automate your lead generation process so you can focus on interacting with as many event attendees as possible. The first thing to do, then, is to make sure that you have set up everything you will need to run your QR code marketing campaigns successfully. If you plan to promote your business at different events, you will need to be able to generate and print QR codes. A landing page is the destination page you plan to send event attendees, visitors, and prospects to. This can be a ‘special offer’ page, a product announcement page, a sign-up page for your newsletter, give away, a competition, etc. 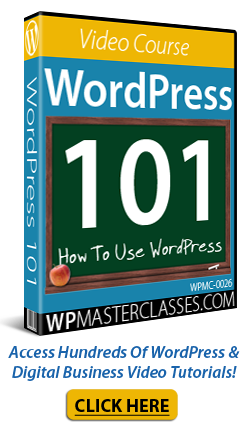 You can easily create landing pages in WordPress by creating a new page or post and adding your own text, images, and other elements, or you can use landing page creation software to build and design landing pages. You will need an email marketing service account so event attendees can sign up to your mailing list or newsletter. There are a number of reliable email marketing services you can choose from, like Aweber, MailChimp, GetResponse, etc. These all integrate well with WordPress. If you plan to offer event participants a discount as an incentive to subscribe to your mailing list , we recommend setting up coupon codes to track your QR code marketing campaigns for each event separately. Later in this tutorial, we’ll show you how to set up an effective strategy for promoting your business at different events using the same QR code in all your promotional marketing materials. For this strategy to work, you will need to redirect visitors to different landing pages. To do this, you can either use a link redirection plugin, or a link redirection management tool. Now that we have listed all the components required to set up your QR code marketing strategy, let’s put it all together. For this example, let’s suppose that you run a WordPress-based e-commerce store with gift cards and discount coupons, that you have set up an email marketing service (e.g. Aweber, MailChimp, etc. ), installed a link redirection plugin or subscribed to a service, and that you plan to attend regular (e.g. monthly) industry, trade, or marketing events. Let’s begin by understanding how our QR Code marketing strategy is going to work. With the above setup, event attendees scan your QR code and are sent through to a landing page with a special offer or discount and an opt-in form where they can sign up to join your mailing list. You are not driving visitors to your website. Sending visitors to your website (instead of a cloud service) not only gives you the opportunity to further promote your business, it also builds your asset, not someone else’s. Although you are now building your asset by sending visitors to your website, you still have the same issues with the QR code described above. Having to print brochures, flyers, banners, posters, etc. for every new event you plan to attend can become very costly and time-consuming. Ideally, you will want to use the same QR code image to promote your business at different events, using different coupon codes and different offers to track your marketing campaigns and do all this without expensive or complicated solutions and without having to edit code. This is where knowing how to use link redirection comes in handy. With the above setup, event attendees scan your QR code and are sent to a landing page, which then automatically redirects them to the special offer page set up specifically for people who have attended the event. This special offer page includes their discount coupon code and an opt-in form where they can sign up to join your mailing list and receive an additional special discount, chance to win a prize, etc. The first step is to create a generic landing page. This will give you a URL to send event participants to when they scan your QR code image. This generic landing page doesn’t even need to have content, as you will be redirecting all visitors who land on this page to the special offer page of your next marketing event. Just in case you have no marketing events coming up or visitors somehow arrive on this page and you have forgotten to set up a page redirection, let’s go ahead and create a simple landing page with an opt-in form included. After creating your landing page, save and publish your new page, then copy the page URL to your clipboard or paste it into a plain text file. If you plan to use the QR code in printed materials (banners, posters, magazines, etc. ), make sure to save these as a high-quality image. Ideally, you will want to create a ‘template’ special offer page that you can easily duplicate for all subsequent events to save time. You can create special offer pages using either Pages or Posts (if you don’t know the difference between these, see our tutorial on WordPress Posts vs WordPress Pages). The last step to setting up your lead capture system using QR codes is to add a redirection from your landing page to your special offer page. After configuring your landing page redirection settings, republish your landing page and scan your QR code to test your QR code marketing setup. Once you have set up everything as shown in this tutorial, creating a new event offer page becomes a very quick and simple process. Repeat the above process for every new event. This set up lets you easily create and run new event offer pages using the same QR code and helps you preserve details of previous events, including performance tracking, page statistics, etc. This section contains additional information about setting up your QR code marketing campaigns effectively. Set up an effective strategy for promoting your business at different events using a template for your special offer pages and the same QR code for all your marketing materials and online/offline promotions. All this takes is a little bit of planning. Test and review the performance of a few different offers and incentives to find out which ones convert the most visitors into subscribers and then use this information to build your mailing list and lead generation pipeline. Make sure that your special offer is clear and easy to understand and that your display materials (banners, posters, etc.) are highly visible so that any users passing by your stall or stand can scan your code from a distance even if they choose not to approach you or start a conversation. All you need on your promotional materials is your call to action and QR code. All other details can be added to the event offer page after attendees scan your code. Click here to download a printable instruction sheet on how to install and use a QR code scanner (zip file contains the PDF instruction sheet). Why Display The Coupon Code Before Visitors Subscribe? In the example used in this tutorial, event attendees scan the QR code in your promotional materials and are directed to your event offer page, which displays the special coupon code and invites them to subscribe to your newsletter or mailing list to receive an additional discount upon signing up, or being entered into a competition, etc. Why did we set up our example this way? Why not have visitors subscribe to your mailing list first to get the special discount code? You can create as many coupons and event offer pages as you want to track the performance of your event campaigns, but if you want to offer separate coupon codes to track each event only after visitors subscribe to your list, then you will need to create a separate mailing list for every event. This will make things too complicated. The easiest way to make this strategy work without complex or expensive solutions, therefore, is to display the event discount on the page before visitors subscribe to your list and then offer them an additional incentive to sign up (e.g. get a further discount, enter into a competition to win a gift voucher, etc.). WooCommerce and many other ecommerce platforms allow you to set up coupon codes with automated rules that prevent coupons being used in conjunction with other offers, so this method will incentivize your visitors to make at least two separate purchases on your site, since they will not be able to use two different coupons together. If you plan to run brand promotions, competitions, Facebook promotions, or any other type of sweepstake or contest that includes an element of chance (or even skill, e.g. “Tell us in 25 words or less …”), make sure that you are not breaking any laws. Depending on where and how you plan to run your promotions, you may need a permit to run competitions or comply with certain legal requirements to avoid getting in trouble. We hope you have found this tutorial useful. Hopefully, now you know how to generate more leads and sales online for your business at marketing events using WordPress and QR Codes without the need for expensive or complicated solutions and without having to touch code. Making money with Amazon allows you to tap into a billion dollar affiliate marketing opportunity (Amazon paid out $1.4 billion to affiliates in 2016). In other tutorials, we show you how to monetize your digital presence with Amazon products using WordPress Amazon affiliate plugins like StreamStore and InstantAzon. In this tutorial, we’ll focus on a smart way to build a list and generate leads and revenue with WordPress, using an ingenious Amazon sales and lead management plugin for WordPress. Whether your site is focused on getting more subscribers, turning more visitors into buyers, or selling more products online, having a monetization strategy for your WordPress site that lets you generate additional revenue by leveraging your existing efforts to drive traffic to your site and market your business online is definitely a plus. And if this monetization method can be fully automated and generate you additional revenue while building you a list of targeted prospects in a completely hands-free way, then that’s even better. InstaGenius is a hands-free Amazon sales and leads management plugin for WordPress that instantly turns your website or blog into a profitable list-building and lead capture system using intelligent tracking, email marketing, and affiliate marketing automation to tap into a vast source of potential leads and sales … window shoppers and hungry bargain hunters searching for great discounts, sales, and irresistible deals online! The plugin then tracks those items on Amazon and sends your prospects an email as soon as the item goes on sale or is offered at a discounted price, helping them save money. When they buy the product at a great price, you get an affiliate commission from Amazon. As visitors search for items they are interested in from this popup window, a range of targeted Amazon products with your affiliate ID added in are displayed and if they click on the ‘Add To Cart’ button, you’ll be cookied for all Amazon purchases made by that customer in the next 90 days. The real power of InstaGenius is creating free ‘price alerts’ for your visitors. The plugin offers buyers advice and invites users to subscribe to your list to receive an instant alert as soon as a discount is offered on their chosen item, saving them time and money. When visitors click on the ‘Add To Bargain Watch List’ button, they will either be asked to subscribe to receive free price alerts if they are new to your site or the button will inform them that they are already subscribed. Once visitors subscribe, the plugin creates a new user account on your WordPress site and automatically adds their details to your mailing list. It then goes to work for you tracking prices on their selected items, sending them price drop email alerts, and helping you to close sales automatically and hands free. The InstaGenius plugin can monitor an unlimited number of products to an unlimited number of subscribers, delivering each subscriber exactly what they want, at a discounted price. Customizable Logo: Display your own logo to visitors. Buyer Advice: This helps to increase urgency and nudges users closer to a buying decision. 90 Day Cookie: Users are cookied with your affiliate ID when they click on the ‘Add to Cart’ button and are taken to Amazon. Suggestions: This feature shows visitors’ most recent searches for easier niche targeting. Load More: Visitors can view more items from Amazon with your affiliate ID embedded in links for their targeted search term. Easy & quick to install, set up and use. Newbie-friendly setup wizard makes everything 100% hands free. 100% targeted. Generate targeted buyer leads in any niche market. 100% hands-free. Build a list and generate commissions from Amazon on auto-pilot. Ongoing income generation. The plugin keeps working for you days, months, and even years after visitors subscribe on your website or blog. Sell more automatically. The plugin automatically does the selling for you and automatically helps you sell more. No writing required. The plugin comes with pre-written customizable email templates. Email follow-ups. You can choose how many follow-up emails get sent to users, select the number of products shown in follow-up emails, add shortcodes to emails for more flexibility, and all emails include unsubscribe/subscribe function for CAN-SPAM compliance. Mobile responsive. The plugin works on all devices and browsers. Genius Store Builder. This premium WordPress theme lets you easily create an Amazon, eBay, or Commission Junction store full of affiliate products in minutes, with self-optimizing product listings, social and autoresponder integration, widget ready areas, Facebook comments integration, 1-click customization, membership features and creating and sharing wishlists. Genius Store Autocontent Plugin. This plugin is the key to setting up automated product listings from Amazon, Ebay and Commissions Junction and generating ‘set and forget’ income. Just install the plugin, add your affiliate details, choose the keywords you want it to search and post for you, how often you want it to find new products to post (with your affiliate links! ), and let it run automatically. It includes a social share module with automated product posting to your social media accounts and features an intuitive dashboard, easy to follow instructions, and lifetime support. If you plan to use the plugin with the store builder WordPress theme, then it is recommended that you set up your Amazon affiliate store on a separate WordPress installation (learn how to install WordPress with our WordPress Installation tutorials). A great use for the InstaGenius plugin is to add it to product review sites. If you run multiple WordPress sites targeting different niches, you can purchase a multi-site license, and if you want to setup sites for clients a Developers License is also available. Additionally, there are no subscription costs, the plugin comes with FREE updates for life, full automation after easy 5 minute setup, and a 30-day ‘Hassle Free’ money-back guarantee. Learn how to grow your business online with webinars and a professional webinar software that lets you run unlimited webinars for unlimited attendees. Online business tools like webinars and online conferencing applications enable organizations to sell online, work remotely, save time, and work more productively. These tools are also great for the environment as they reduce the need to travel, and provide people loads of other benefits, such as making tasks more efficient. Businesses are always looking for new ways to improve productivity, reduce expenses, save money and time, work smarter and sell more goods faster. Webinars and web conferencing tools allow you to do this quite easily. Webinars can increase your business in many different ways. You can use webinars to inform people and raise awareness about your products and services, deliver announcements and training sessions to a live audience who can ask you questions and provide you with instant feedback, help users get clarification on any issues they may have, and reach a global audience of customers for your business, events, training courses, services, membership sites, and more. Additionally, webinars and video conferencing tools allow you to build new relationships, grow your prospect lists and even create new info products “on the fly” simply by recording your presentations and repurposing these as videos, podcasts, presentation slides with transcriptions … including offline items like DVDs. Webinar software, then, are a fantastic and effective way to do business, promote information and share ideas. The problem, however, is that the cost of using webinar software can be quite expensive or even prohibitive for many businesses, with some requiring you to remain subscribed and pay ongoing fees, and restricting the number of viewers who can register. Fortunately, you can run webinars cost-effectively and without limitations using the software described below. Webinar JEO is a professional standalone webinar software-based solution that gives you ultimate control of your webinars and live presentations. Live Webinars: Webinar JEO includes all of the latest webinar technology features to help you deliver interactive and engaging events and live presentations online. Recorded Webinars: Replaying webinars can help you generate more sales, but setting up replays can be time-consuming. Webinar JEO automatically records your webinars and sends out automated replay sequences to no-shows, fence-sitters and people who couldn’t attend your event the first time around. Evergreen Webinars: You can record and replay your webinars over and over again. Automated evergreen webinars allow you to generate recurring income for your business on autopilot. “Recorded-Live” Webinars: With Webinar JEO, you can host recorded webinars as if they were live and answer questions, give feedback, and make sales while your original webinar is being replayed. With Webinar JEO, everything is done in a web-based environment, which you can access from anywhere. Creating a webinar with Webinar JEO is easy and lets you deliver an engaging user experience to a worldwide audience. Just add a title and choose a date and a time and your webinar is ready to go live, allowing you to start accepting registrations immediately and share your content online and on social media. The software’s admin panel is also very easy to navigate. With Webinar JEO, you can run unlimited webinars with unlimited attendees and engage audiences with a true live-stream experience. Webinar JEO is built using the latest webinar technology and runs on the highly scalable and robust Amazon AWS web services platform, giving you infinite growth with no limits on attendees or the number of webinars you can run. Webinar JEO lets you create engaging and fully immersive webinars using many interactive webinar features (see next section). For more information, visit the Webinar JEO website. Webinar JEO lets you run unlimited live webinars and online conferencing events to small groups or large global audiences with true live streaming for seamless webinar performance. Webinar JEO lets you create a “set and forget” system that automatically captures, follows up, and engages with new (or re-engages with old) leads (see below). Webinar JEO integrates with all major email service providers. API Integration: The software’s API technology lets you add your leads directly to your database without the need to touch any code. Built-In Lead Capture: Webinar JEO comes preloaded with a selection of webinar lead capture forms. Built-In Follow Up Messages: Event registrants automatically receive event links and email reminders. You can use the software’s built-in email templates or customize your follow-up and registration emails. Webinar JEO also lets you add unlimited follow-up sequences. Notify Previous Attendees: One-click feature lets you invite attendees from previous events or previous sources to attend your latest webinar. Webinar JEO is mobile responsive, so attendees can view your webinars on their desktop and mobile devices with IOS and Android apps. Webinar JEO provides full integration with Facebook Live. You can live stream and share your content, screen, presentations, webcam, desktop, or any file you like. Webinar JEO’s interactive whiteboards let you draw on presentation slides, create diagrams on the fly, upload images to multiple white boards, and make live annotations. Delegate your presentations to others. This is great if you want to introduce an expert to your webinar and allow them to take over running a segment of it. You can also deliver a seamless global webinar by having multiple presenters or participants join in at once. Open up the microphone to any attendee. Participants can ask questions and contribute to your presentation. Mute and remove attendees. Manage disruptive participants. Polling your audience lets you improve rapport with your audience and fine tune your presentations to make sure you stay on track and deliver the information that is most relevant to users’ needs. Quizzes instantly engage users, help turn your audience from passive listeners to active attendees, and craft your message for maximum effectiveness. Using surveys in your webinars not only gives you valuable feedback, it also allows you to poll your audience and find out what your audience needs so you can create and deliver new content, new services, new solutions, and new webinars. You can trigger events during your live presentations at a specific point of your choosing, such as displaying special offers and ‘click to buy’ buttons. This mode lets webinar attendees see you as you present your information in high quality video. This mode allows you to walk through powerpoint presentations, keynote, and slide presentations and show browser or screencast demonstrations. This mode is useful for demonstrating complex processes or helping users configure software automation. This mode lets you draw and make live annotations directly on the screen as you are presenting. Webinar JEO’s hybrid mode lets you deliver structured presentations using pre-recorded elements while participating in the event and interacting with a live audience (e.g. to answer questions). Webinar JEO includes professional templates that save you time and money creating web and mobile responsive webinar pages, registration pages, presentation pages, thank you pages, and replay pages. You can also add promotional videos to entice more attendees and increase enrollment and registrations. Webinar JEO was developed by Walt Bayliss, a well-known and highly regarded WordPress plugin and software developer. Webinar JEO is a hosted solution, well-supported, and backed by a no-risk, thirty day, 100% refund guarantee. During your first 30-days, you are encouraged to thoroughly test the software by creating and running as many webinars as you like, for as many attendees as you can register. Webinar JEO can be purchased on a month-to-month basis or annually, with no lock-in contract. Note: The cost of purchasing Webinar JEO can vary, depending on whether there are any promotions or limited-time special offers. Turn your powerpoint presentations and seminars into instant info products and develop additional streams of income with Webinar JEO. The plugin automatically records all of your presentations, so with a little planning and a small investment of time and effort behalf, you can significantly grow your business and increase your profitability. For example, if you are not an expert in your niche, you can record online interviews featuring invited experts who will answer all of your questions or talk about a specific area creating thus much of the information for the webinars. This gives you high-quality content that required no expert knowledge on your behalf to create. Webinar JEO lets you run virtual meetings and provide high-quality webinars, online training, sales presentations and more without limits on how many people you can present to, and with no ongoing costs. If you run a business or sell products or services online, or if you plan to deliver training to remote users, manage virtual meetings, make sales presentations, etc… then we highly recommend using Webinar JEO. It is a cost-effective, easy to use, well-supported and complete professional webinar package that can help you gain a competitive advantage, boost engagement, and increase sales conversions.